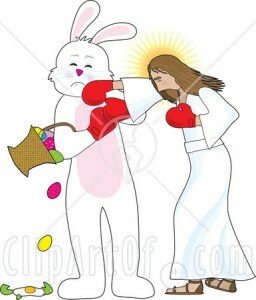 Happy Easter (Zombie Jesus Day)! I hope everyone had a fantastic Easter. I know most people on this site will not have celebrated Easter like the majority of people that I saw and heard from today. Some people reading this may be offended to even hear me say Happy Easter. To those people, I can only stress that you must take deep breaths and not get so worked up about verbal expressions. I celebrate Easter much like I celebrate Christmas: as a time to be with family and eat larger-than-average amounts of food. To me, there’s no shame whatsoever in calling the holiday “Easter”, since it has little to nothing to do with Christianity in its origins. Christians are the ones who look like assholes celebrating the day with chocolate bunnies and plastic eggs. After all, aren’t they supposed to be celebrating the resurrection of the man that made the ultimate sacrifice for them? Seems like Pagan fertility icons wouldn’t fit in very well with the whole “dying for your sins” nonsense. Either way, I hope everyone had an enjoyable day. If you speak to any Christians tomorrow, ask them how they reconcile the Pagan origins of the celebration with their intended meaning. Maybe it’ll make them think twice in December before they launch another War on Christmas campaign for their evergreen trees and twinkle lights on Jesus’ birthday.